From childhood, we are immersed in a field of forces that shapes the two basic needs that all of us have; the need for control (over ourselves) and the need for vision (of ourselves). These two needs reflect the dual nature that only humans have of physical and spiritual being. While the spiritual, transcendent part of our self knows no boundaries and aims high; the physical part knows and undergoes fears. Invariably, the simultaneous satisfaction of these two needs will prompt us into a situation of conflict. This time though, the conflict will not be between two people wanting different things and neither will it be a dilemma between two equally desirable wants. The conflict originated by these two needs, for individuals as well as for organizations, will be between something that we strongly desire (and we do not seem to be able to access) and a highly undesirable situation that is the result of how our fears force us to cope with the need for control. This kind of conflict is called “core conflict cloud”. 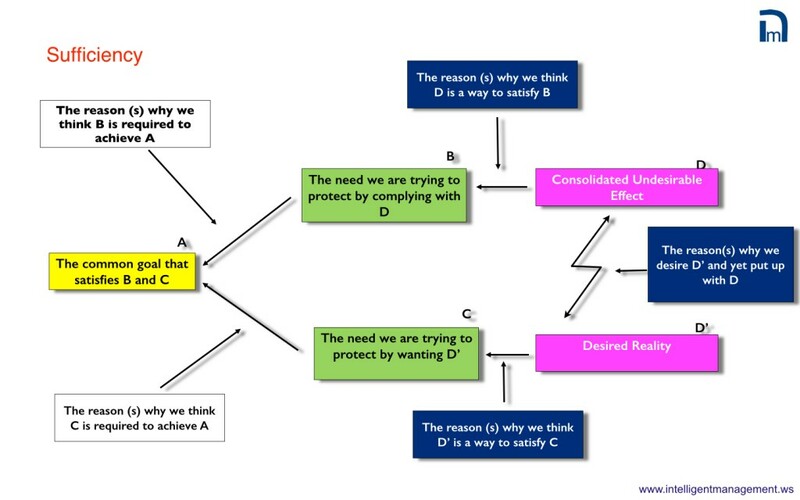 It is a powerful Thinking Process Tool from the Theory of Constraints. The exercise of building a Core Conflict Cloud for an organization is invaluable and the process can be exhilarating. Let me try and give you a sense of this. In the last 15 years I have worked with hundreds of top and middle managers to build custom made implementations of the Decalogue and the starting point has always been the writing of the core conflict. A group of managers sits for two-three days in a room starting with a “bitching and moaning” session where all their Undesirable Effects (UDEs )are verbalized. This first phase is a very “feel good” one, everybody agrees that the company is plagued by these effects. These effects are and feel “real” and everybody would like to get rid of them. Summarizing all the UDEs in one single statement is normally a little cumbersome but it is generally done in few hours. This is the starting point the procedure I list below and the end result is normally welcomed as a breakthrough. What happened? The Conflict Cloud helps to sharpen our intuition. The group of managers in just a few days has moved from an often disparate set of non-verbalized hunches to a clear cut picture of the forces that keep them from achieving their goal. Moreover, a precise description of the needs that craft the psyche of the organization goes a long way in helping to understand the “why” we are trapped in this conflict, the reason for it. I can safely say that no top management strategic retreat session delivers a tangible and operational output like this one. Now that the intuition is strong we can make it stronger. Six: we verbalize the most basic goal whose achievement must pass through the simultaneous satisfaction of B and C; we call it A. In other words, B and C must be simultaneously satisfied in order to achieve A. What transforms a core conflict into a full-blown picture of our current reality is a disciplined, orderly elucidation of all the mental models that give birth to the conflict. These mental models are deeply rooted images that we have of ourselves and the world around us. These mental models, which we may also call “assumptions”, are the cognitive lenses through which we perceive reality. Assumptions are, like any other mental construction, the result of external (the environment, education, experiences, values, etc.) and internal (the chemistry and physics of our mind) factors. The difference between an assumption and a statement of reality is only the realm of validity, determined often by cultural circumstances. (If you want a practical example of this last statement, take a sentence like “in a democracy every citizen is entitled to decent, affordable and reliable healthcare” and ask for a comment from a statistically representative sample of individuals in the US, Canada, and Europe). 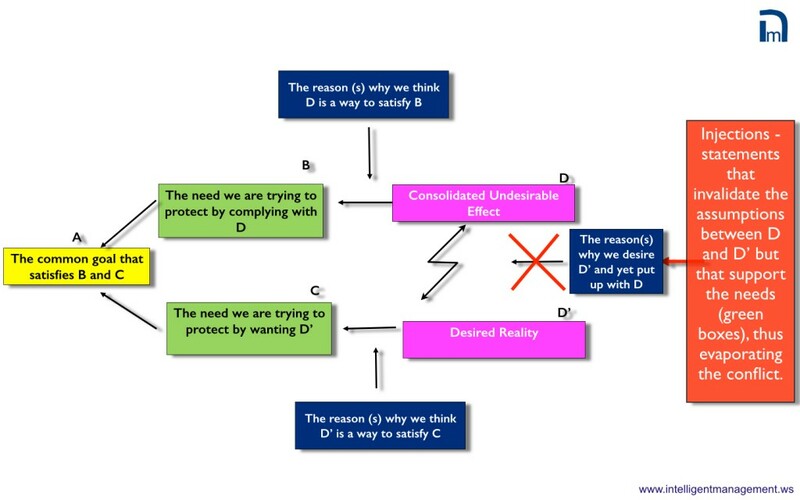 Assumptions are the logical connectors between goal, needs and wants; they help us see the logic that shapes the conflict. A conflict with its set of clearly verbalized assumptions portrays the current reality precisely in the way we experience it and is the strongest possible support we can provide to our intuition.